Keywords: Grounding, Balancing, Harmony, Strength, Solutions, Stability, Communication. Agate has a slow and steady energy vibration that gradually couples with the wearer. It should be worn for at least 2 weeks. Agate gemstones are slow, steady, strong, and consistent. These gems bring stability into your life that insures a sense of being grounded and well balanced. Agate harmonizes yin and yang energy, (the positive and negative, the male and female, the inner and outer), by promoting wholeness, inner-strength, self-acceptance, and confidence. They encourage self analysis and open communication. These natural healing gemstones boost mental abilities such as perception, memory recall, analytics, and concentration. Agate brings to light practical solutions and aids in creative endeavors through quiet contemplation and spiritual growth. These self-enhancing gems aid in your ability to overcome insecurity, anger, and negativity. They inspire peace, love, and courage for new beginnings. "Agates are grounding stones, bringing about an emotional, physical, and intellectual balance. They aid in centering and stabilizing physical energy." [Hall, 39] Judy Hall, The Crystal Bible (Cincinnati, OH: Walking Stick Press, 2003). Encourages: Peace, Love, Courage, Self-Acceptance, Inner-Strength, and Balance. Dissolves: Anger, Negativity, Tantrums, Internal Tension, and Insecurities. Memory Recall, Analytics, Concentration, Creativity, Communication, and Perception. Gastritis, Eyes, Stomach, Uterus, Lymph Nodes, Pancreas, Blood Vessels, and Skin Disorders. Amazonite has a soothing vibration that dispels aggravation and resolves inner conflict. Amazonite is a "Stone of Integrity." This empowering gemstone encourages you to search for your own truths, in order to develop a sense of integrity. It strengthens your ability to set boundaries with others and instills courage for standing up for what you believe in. Amazonite is a soothing gemstone that alleviates feelings of worry, fear, and doubt. It filters information received in the brain and combines it with intuition, allowing freedom of expression. This is an extremely soothing stone. It calms the brain and nervous system and aligns the physical body with the etheric, maintaining optimal health. It balances the masculine and feminine energies and many aspects of the personality. [Hall, 50] Judy Hall, The Crystal Bible (Cincinnati, OH: Walking Stick Press, 2003). Amazonite rejuvenates the heart and throat Chakras. This is a stone of emotional courage, harmony, and balance. It broadens your perspective and allows you to see both sides of any situation. This is an excellent gemstone for those who have gone through any sort of emotional trauma. It aids in overcoming loneliness, brings equality to partnerships, and allows for open and honest communication. Amazonite is a "Stone of Prosperity". In business, it attracts new customers and assists one in being in the right place at the right time, being open for opportunities. Soothing, Calming, Emotional Balance, Courage, Confidence, Alleviates fear, worry, and doubt. Empowering, Encouraging, Intuition, Communication, Clarity, Expression. Osteoporosis, Tooth Decay, Calcium Deficiency, Metabolism, Muscle Spasms, Protection from Electromagnetic Smog and Pollution, Absorbs Microwave and cell phone emanations. Keywords: Courage, Protection, Self-Healing, Peace, Trust, Altruism, and Wisdom. Amber is a potent protector and healer. Amber is a "Stone of Courage and Protection." This powerful, yet gentle grounding stone draws out negative energy and blockages. It transforms this energy into positive forces that allow the body to heal itself. Amber purifies the Chakras, as well as the surrounding environment. This gemstone is perfect for eliminating fear, stress, and depression. Amber stimulates creativity and encourages an optimistic outlook. It promotes emotional stability and clears negative thoughts. This is an ancient gem that provides courage and protection. It empowers you with motivation toward achieving goals. Clears Negative Thinking, Promotes Positivity, Optimism, Harmony, Self-Expression, Confidence, Alleviates Depression, Stress, Fear, Doubt, and Worry. Memory, Learning, Dissolves Opposition, Integration, Decision-Making, Clarity, Builds Patience and Understanding, Wisdom, and Creativity. Detox, Liver, Kidneys, Spleen, Bladder, Stomach, Laryngitis, Goiter, Physical Pain, Headaches, Throat, Gallbladder, Strengthens Mucus Membranes, and Heals Wounds. Keywords: Calming, Soothing, Enlightenment, Serenity, Insight, Peace. Amethyst purifies the mind, improves motivation and enhances intuition. These gems alleviate sadness and grief. They promote emotional balance, instill confidence, and facilitate the decision-making process. Amethyst is a "Stone of Spirituality." This heavenly crystal has a powerful and protective vibration that blocks negative energy, calms scattered thinking, eases stress, and puts overindulgence to rest. Amethyst gemstones aid in overcoming addictions and encourage selflessness through a higher state of consciousness. They calm anxiety and stimulate the mind, bringing deep understanding and spiritual insights. Amethyst stabilizes mood swings, creating serenity within the environment and opening the door for spiritual communication. This stone brings protection from recurrent nightmares, night terrors, and restlessness. Amethyst is a wonderful gem to place in your child's room, as it will ensure restful sleep and stabilize the child if he/she awakens in a fearful state. Types of Amethyst: Lavender Amethyst, Dogtooth Amethyst. Calming, Comforting, Soothing, Alleviates Depression, Rage, Tension, Brings Emotional Balance, Confidence, Peace, Dispels Anger, Fear, and Grief. Communication, Awareness, Focus, Decision-Making, Improves Memory, Motivation, Protects from Nightmares and Mental Conditions. Acne, Blood Disease, Burns, Cancer, Circulation, Color Blindness, Detox, Digestion, Drunkenness, Emphysema, Heart Conditions, Immune System, Infections, Insomnia, Lungs, Metabolism, Oedema, Water Retention, Parkinson's Disease, Panic Attacks, Pineal Gland, Pituitary Gland, Scalds, Skin Conditions, Tumors. Ametrine is a "Stone of Jubilant Joy." This divine gemstone brings guidance by bridging a connection between the physical and spiritual realms. This is an excellent stress-relieving stone that promotes optimism, happiness, emotional and physical healing, and joyfulness. Ametrine brings harmony, it alleviates negative energy caused by mental dissatisfaction, depression, and anxiety. This blended stone consists of Amethyst and Citrine, two celestial gems that work together to sooth the spirit and lift your mood. Ametrine promotes confidence, creativity, decision-making, mental clarity, and spiritual transformation. It encourages you to reach your full potential as a spiritually connected individual. Soothing, Uplifting, Happy, Satisfaction, Cheerful, Relieves Anxiety and Depression, Encouraging. Alzheimer's, AIDS, HIV, Immune System, Fatigue, Headache, Metabolism, Jaundice, Ulcers, and Circulation. Keywords: Courage, Communication, Love, Creativity, Awareness, Intuition, Spirituality. This gemstone has a calm energy vibration that enhances clarity in thought, reduces stress, and quiets the mind. The energy from Aquamarine provides space for spiritual growth, it has an affinity with sensitive people. Aquamarine is a "Stone of Courage," This enticing crystal harmonizes the soul with it's dreams and desires. It protects against pollutants and counteracts against forces of darkness. This courageous gemstone alleviates the need to judge and be judged. It eases tension and feelings of being overwhelmed with responsibilities, while encouraging an upright, persistent, and dynamic personality. Aquamarine encourages self love, self care, creativity, and vision. Aquamarine calms fears, sharpens the intellect, and clears up confusion and dis-order. It has an energetic vibration that promotes bringing unfinished business to a conclusion. If you are planning something great and need a boost of encouragement, Aquamarine will support you in taking the next step. Associated with the Throat chakra, Aquamarine helps overcome the fear of speaking, and is an excellent stone for teachers and presenters of all types. It relaxes speakers to a stage of consciousness in which they are fully aware of their own truths, wisdom and feelings, and able to articulate them with clarity and conviction. It also allows one to speak clearly and without anger in difficult situations. [Simmons, 49] Robert Simmons & Naisha Ahsian, The Book of Stones (Berkley, CA: North Atlantic Books, 2007). This is an amazing gemstone for meditation. It sharpens intuition and opens clairvoyance. You are likely to reach higher states of consciousness and spiritual awareness, with Aquamarine. Love, Compassion, Understanding, Courage, Communication, Calms Anger and Fear, Releases Emotional Baggage, Soothing. Aventurine attracts wealth, abundance, and prosperity into your life. Aventurine is a "Stone of Opportunity." This magnificent green gem is known as one of the "luckiest" gems to have, especially when it comes to manifesting wealth and abundance. Aventurine promotes feelings of well-being and positivity. They calm negative emotions and heighten your ability to become aware of current opportunities. Green Aventurine protects the Heart Chakra, it encourages a continuos flow of love. It defuses negative situations and turns them around, revealing leadership qualities buried within. Compassion and empathy are greatly enhanced with this gemstone, as well as clarity in perception, and your ability to express creativity. The energy from Aventurine vibrates with optimism, confidence, creativity, and perception. It balances emotional and intellectual abilities, while calming feelings of irritation, frustration, and anger. This beautiful stone, however, is not merely an attractor of luck, but one that aligns conditions so “opportunity” is inevitable. Green Aventurine releases old patterns, habits and disappointments so new growth can take place. It brings optimism and a zest for life, allowing one to move forward with confidence and to embrace change. It enhances one’s creativity and motivation, and encourages perseverance in maneuvering life’s obstacles. It also reinforces one’s decisiveness and amplifies leadership qualities, injecting a sense of humor and openness to the ideas of others. [Simmons, 55] Robert Simmons & Naisha Ahsian, The Book of Stones (Berkley, CA: North Atlantic Books, 2007). [Melody, 136] Melody, Love Is In The Earth (Wheat Ridge, CO: Earth-Love Publishing House, 1995). [Hall, 73-74] Judy Hall, The Crystal Bible (Cincinnati, OH: Walking Stick Press, 2003). Aventurine is a prosperous gemstone for those who are manifesting a new start. The soothing energy from this crystal encourages perseverance, yet is beneficial for calming quick tempers. It proves beneficial for attention disorders, emotional recovery, and brings protection from environmental pollutants. Calms Anger, Soothes, Balances Emotions, Acceptance, Emotional Trauma, Heartache, Confidence, Control Issues, Protection, Humor, Joy, Hope, Happiness, Grounds. Perception, Understanding, Attention, Focus, Decision-Making, Dyslexia, Growth, Creativity, Motivation, Leadership, Perseverance, Opportunities. Heart, Circulation, Blood Pressure, Eye Sight, Hair Growth, Ovaries, Thymus, Tissue repair, Metabolism, Lower Cholesterol, Anti-Inflammatory, Migraines, Nervous System, Eczema, Skin Conditions, Lungs, Sinuses, Allergies, and Adrenals. Azurite is a "Stone of Heaven." This celestial gemstone brings the spirit into alignment with its purpose. It clears confusion and promotes new and uplifting perspectives. 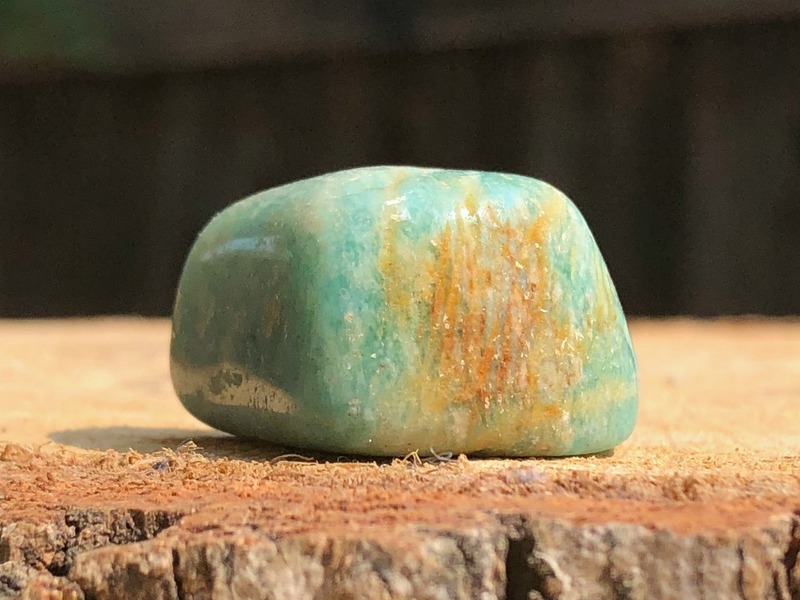 This gemstone activates intuition and awakens psychic abilities, it is often used for meditation, dream enhancement, and "out of body" experiences. The rich vibrancy of its dark-blue energy resonates to the exact frequency of the Third-Eye Chakra, and has been guiding souls to enlightenment since the earliest civilizations began. [Hall, 77-78] Judy Hall, The Crystal Bible (Cincinnati, OH: Walking Stick Press, 2003). Azurite alleviates worry, fear, grief, and doubt. It gives courage to overcome self-restricting patterns, and provides necessary security that allows one to verbalize their truth. This stone will aid in overcoming an inferiority complex, and proves useful dealing with domestic bullying. Azurite eases tension between relationships at home, especially when there are a couple of generations that are living together, or with step-parents. Azurite stimulates intellectual pursuits and is an excellent gemstone for students, especially "life-long" students. It enhances focus, encourages concentration, and aids in memory recall. An excellent crystal for examinations, interviews, presentations, or negotiations, Azurite also fortifies long-term career plans, especially in large or very structured organizations. It is particularly beneficial for careers in all governmental departments, museums, libraries and universities. [Eason, 217]Cassandra Eason, The New Crystal Bible (London: Carlton Books Ltd., 2010). Relieves Stress, Grief and Sadness, Brings Courage, Calms Nerves, Self-Expression, Letting Go, Overcomes Phobias. Intellect, Memory, Vision, Psychic Abilities, Intuition, Insight, Wisdom, Stimulates Discovery, Focus, Concentration, and Retention. Spine, Bones, Joints, Kidneys, Arthritis, Alzheimer’s, Dementia, Migraines, Liver, Gallbladder, Spleen, Pregnancy, Skin, and Teeth, Rib Cage, Small Bones, Development of Embryo, Circulation, Brain Damage, Improves Reflex. Keywords: Revitalize, Purifies, Cleanse, Courage, Creativity, Protection, Grounding. Bloodstone stimulates mental activity and greatly enhances motivation, (it get's your blood pumping)! Wear Bloodstone to reduce irritability, aggressive behavior, and impatience. Bloodstone is a "Stone of Purification." This magnificent healing stone is an excellent blood cleanser that purifies and improves circulation. It revitalizes and instills feelings of being grounded and well protected. Bloodstone heightens intuition and guides you to avoid dangerous situations. It increases creativity, aids in physical healing, enlightenment, nobility and self-awareness. It vibrates energy of courage, comfort and strength. Bloodstone calms the mind, dispels illusion and confusion, and promotes making positive choices. It assist you in doing the right thing in the present moment. Bloodstone stimulates the immune system and helps fight colds, influenza (Flu), inflammation and infections. This super healing stone revitalizes and re-energizes the body after illness, injury or exhaustion. Grounds, Conforts, Strengthens, Supports, Calms Aggressive Behavior, Reduces Irritability, Promotes Patience. Anemia, Bladder, Cancer, Childbirth, Circulation, Cramps, Detox, Exhaustion, Flu, Hemorrhoids, Inflammation, Infections, Intestines, Metabolism, Leukemia, Kidneys, Liver, Piles, Spleen, Stomach Problems, Detox, Tumors. Keywords: Protection, Grounding, Leadership, Self-Assertive, Encouraging, Motivation. Bronzite promotes transition in a harmonious way. Bronzite is a "Stone of Polite Protection." It strengthens non-bias judgment, increases self-assertive abilities, and promotes taking control of your life. This charming gemstone helps you take necessary actions, while doing so in a loving and tactful way. Bronzite encourages you to, "Keep it classy!" It returns ill-wishes and curses back to the perpetrator, providing spiritual protection and inner-security. It proves effective against negative thinking and self-defeat. Bronzite builds peace of mind and facilitates the ability to just, "be." This is an extremely beneficial gemstone for those who have a hard time being still, as it brings total serenity. On the contrary, this stone is also beneficial for putting plans into action and making important decisions. It promotes judgment without prejudice, alleviates feelings of doubt, and restores harmony in your life. Bronzite enhances self-esteem, self-help, and confidence. Stability, Security, Self-Control, Calming, Centering, Harmony, Protection from Negative Energy, Self-Esteem, Positivity. Decision-Making, Reaching Goals, Judgement, Harmony, Self-Help, Confidence, Assertiveness, Learning.